Tuesday February 19th 1901 Weather intensely cold again. Mort & Billy Coyle went back for a couple more loads and Will helped me some. I have had a cold for nearly a week and now it is very bad, Billy went back to town tonight he will not work anymore Wednesday February 20th 1901 It is 56 years today since Father & Mother were married. We went down home to dinner. There were a few of the relatives there. A very cold day. Thursday February 21st 1901 Mort went after a load to the valley. I did a little work about the house in the morning and in the afternoon Will and I both sat by the fire. I am nearly sick with my cold and we are both nearly worn out and need rest. Friday February 22nd 1901 A very cold day. I did the regular work in the forenoon and in the afternoon cleaned the little pantry Mort went to town in the afternoon. 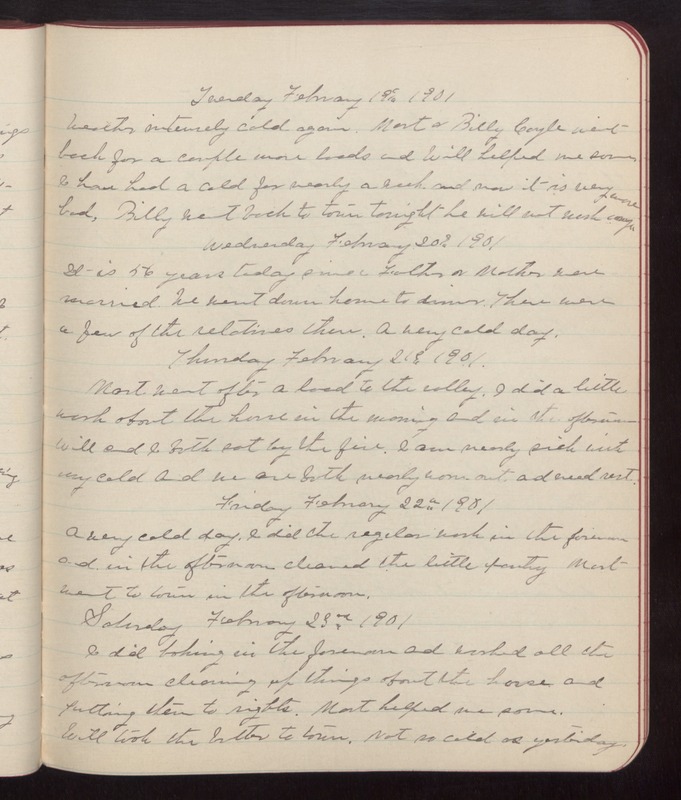 Saturday February 23rd 1901 I did baking in the forenoon and washed all the afternoon cleaning up things about the house and putting them to rights. Mort helped me some. Will took the butter to town. Not so cold as yesterday.